That means using the right pronouns. Pronouns (I, you, he, she, they, etc.) are used all the time when referring to people. They are an important part of speech and a useful shortcut to referring to people by name. But pronouns are gendered and it’s important to be aware that not everyone’s pronouns are what you might expect them to be. Not everyone’s gender is the one they were assigned at birth or the one you might guess from their appearance or the way they dress. Not everyone’s pronouns match their gender or are the same every day. Some people don’t have or use any pronouns at all. 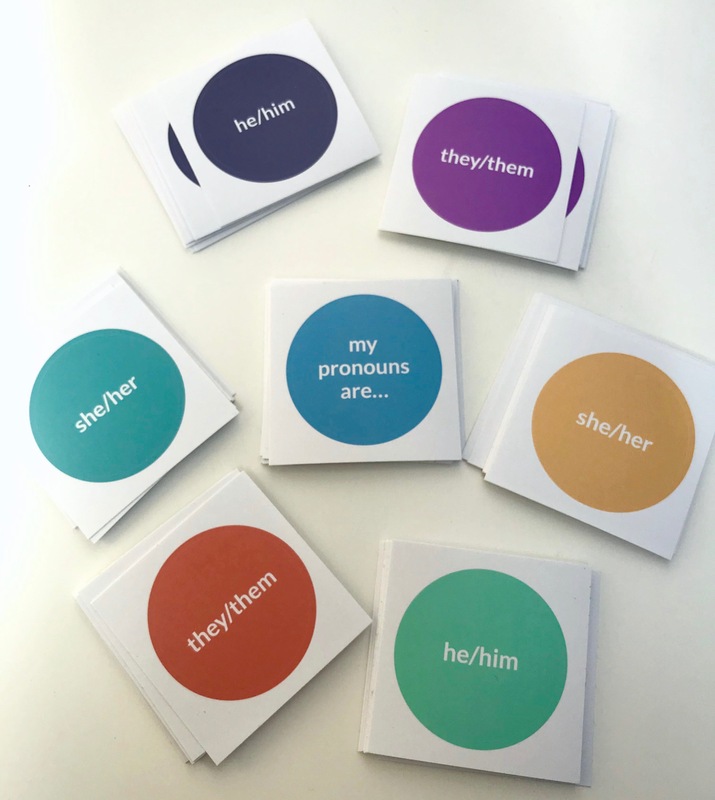 The onus is usually on these people to broadcast or inform others of their pronouns, and having people use the wrong ones can be very uncomfortable and othering, especially if they have trouble having their gender seen or respected in other aspects of their lives. It can be a reminder that their pronouns aren’t obvious to everyone. I am agender, which for me means that I don’t have or experience gender at all. My pronouns are they /them/their/theirs/themself (or they/them for short), but most people I interact with gender me incorrectly due to assumptions based on the way I look or sound. It’s a constant reminder that the world sees me differently from who I am. Every time someone who doesn’t “need” to, announces their pronouns, it makes it easier for those of us who do to announce ours, and signals that it would be welcomed and respected. Ask people what their pronouns are. Even if they look to you like a certain gender, it doesn’t mean they are, or that their pronouns match your expectations based on their gender. Be aware that some people’s pronouns aren’t always the same in all contexts, so consider where you’re asking, and whether it may be more appropriate to ask in private. If you get someone’s pronouns wrong, correct yourself and move on. Centre their experience, not your own, and don’t make a big deal about it. If you find yourself doing it a lot, then maybe consider apologising properly, but do it in private, and make the effort to improve. Bear in mind that pronouns are often just one aspect of gender expression, and consider the other language that you use to refer to people. For instance, someone who uses “she” or “they” might not be comfortable being referred to as “dude” or “man”, or being included in the term “guys”. Don’t ask for someone’s gender if you really only need to know their pronouns. If you just need to know how to refer to them, their gender is unlikely to be relevant, and you’re less likely to make incorrect assumptions about how to refer to them. Avoid the term “preferred pronouns”. People’s pronouns aren’t a preference, they just are. If someone’s pronouns or gender are unfamiliar or new to you, try doing your own research before asking questions. We spend a lot of time fielding and explaining basic questions and concepts, which can get exhausting, and it means a lot when people do their own work to try to understand our experiences. Above all else, be respectful of people whose experiences differ from yours, and be curious to learn and understand them better. If you want to learn more, there are plenty of resources online talking about pronouns and gender. I am also generally happy to chat about trans and gender issues with people interested in understanding. I’m @erbridge on Twitter, and my DMs are usually open.